Please follow the link to the 2019 registration. Level A is all players that will be going into 8th grade next year. Level B is all players going into 7th grade. Level C is players entering 6th and Level D is players entering 5th grade. Welcome to the official website of the Cedar Grove-Belgium Broncos Youth Football Program. Our mission is to teach young people the fundamentals of football while instilling the importance of discipline, sportsmanship and hard work! To be eligible to participate in the Broncos programs your child must live in the Cedar Grove-Belgium School District or, in the case of school choice, have attended school in the district for at least two consecutive years. Please explore the website to learn more about our program. 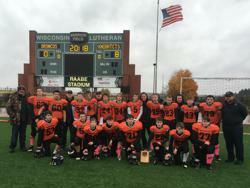 On Sunday, Nov 4th, 2018, the 8th Grade Broncos lost a heartbreaker to Nicolet 8-0 for the championship at Raabe Stadium. Great season and good luck next year as Rockets! FYI - For those interested in seeking information on the league, other teams and standings, the site is http://www.aayfl.org. ©2019 Cedar Grove-Belgium Broncos / SportsEngine. All Rights Reserved.